Be A Front Row Person! | It's In The Sauce! ← I Just Want You To Be A Mom! 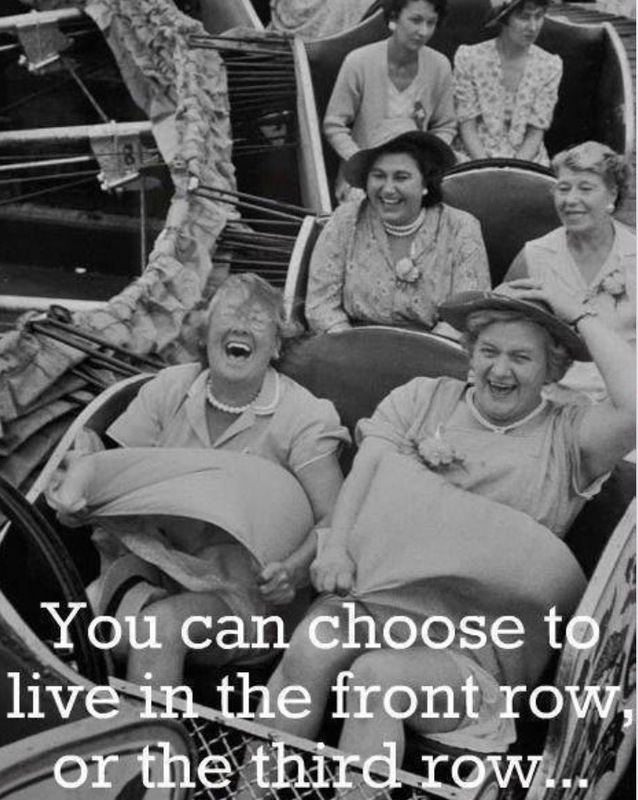 Be A Front Row Person! It was dance rehearsal for our oldest and youngest granddaughters. The rehearsals were at staggered times for the different ages, so my daughter and I were there for the afternoon. We had been sitting and watching for a couple of hours when a young girl, who was probably about six years of age, and her mother came into the auditorium. We were on the second row. The young girl rushed down to the very first row, only to be pulled back by her Mom, who went to a middle row, and said, “Come back here; I’m not a front row person!” I couldn’t help but feel sad for the young girl who was obviously a front row person, but whose zest for that would likely be squelched in various ways. Knowing that her mother was probably her most important role model, her mother’s unwillingness or inability to be a front row person would make it difficult for her daughter to be. What does “being a front row person” really involve, and why is it important? First of all, it involves confidence. It can also involve arrogance, but it doesn’t have to. Confidence and arrogance are very different. People who are confident can be front row people without expecting the spotlight to be on them. They are fine with being noticed, yet they do not need or demand the attention of others. People who are arrogant tend to need and demand the attention of others. Confident people attract the attention of others; they do not need to demand it. While arrogant front row people attract the attention of others, it is usually negative attention. Being a confident front row person shows interest in what is going on and in others, both of which are positive behaviors, behaviors which attract others to us. It is reciprocity in action. It also shows positive energy, energy which can be energizing to others, especially those in charge who may subconsciously reflect back positive behaviors. Being a front who person can be natural or learned behavior. There are individuals who are born front row people, who are not even aware of it, for it is so natural. Then there are others who have learned the steps to be a front row person, knowing it is important, but for whom it is not easy or natural. Each person knows whether or not he is a front row person in most situations, and is by habit likely to remain in that position. Behavior we adopt becomes second nature to us, and unless there is a strong urge to change, we don’t. I do hope that it is obvious that sitting in the front row is not the only way to be a front row person. Any behavior or action that involves us showing our confidence and being engaged in what is going on and with others can be front row behaviors. Giving our opinion without being asked is one example. Initiating interaction and conversation with others is another example. Being assertive (not aggressive) is an example, in ways that include not waiting for permission to do something we are skilled to do, even if we haven’t been told to do so. Being an appropriately direct communicator and not hedging what is said, worried about the approval of others, is another example. There are other examples as well. Hopefully the examples given are sufficient to understand this perspective. What do you think? Are you a front row person? If not, are you willing to do what it takes to learn to be, and to consistently practice the behaviors? You never know what might be the positive result for you, and maybe even for others. A six year old girl can be watching and learning from you. This entry was posted in family, Relationships and tagged business blog, confidence, relationships. Bookmark the permalink.